The Made Up Maiden: Product Review: Maybelline Color Whisper Lip Colour and Swatches. 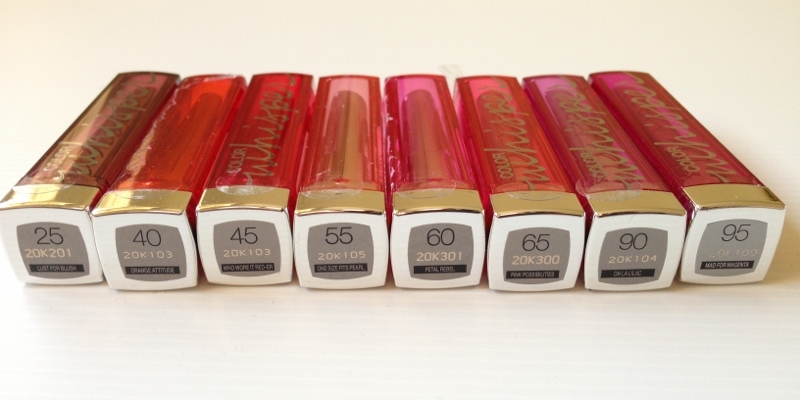 Product Review: Maybelline Color Whisper Lip Colour and Swatches. Apologies for not having blogged for a few days, things have been a bit crazed at work and I've been exhausted! I also pulled a muscle in my back last week so I've been trying to take things easy! I have a new review to share with you today, and that's of some lovely new lipsticks from the Maybelline range, the Color Whispers! I was fortunate enough to receive the entire range in my Maybelline advent calendar for Christmas in July, and you could probably hear my squeals of joy from a block away! The packaging is cute and the transparent cases allow you to see which shade you've picked up; however, some of them are deceptively close in colour so it's quite possible to accidentally pick up the wrong shade! Maybelline Color Whisper lip colour. The case does lock together quite securely, so you won't have to worry about it coming apart accidentally in your bag. The only thing I noticed about mine is that the plastic is actually peeling off on some of the cases, it doesn't affect the product so it's not too much of a worry, but I thought I would point it out anyway (you can see it on Petal Rebel - the fifth shade from the left, below). The tube of the Color Whispers are quite slim and sleek, which I love! It makes it very easy to trace around the outline of your lips. L-R:25 - Lust for Blush, 40 - Orange Attitude, 45 - Who Wore It Red-Er, 55 - One Size Fits Pearl, 60 - Petal Rebel, 65 - Pink Possibilities, 90 - Oh La Lilac and 95 - Mad for Magenta. 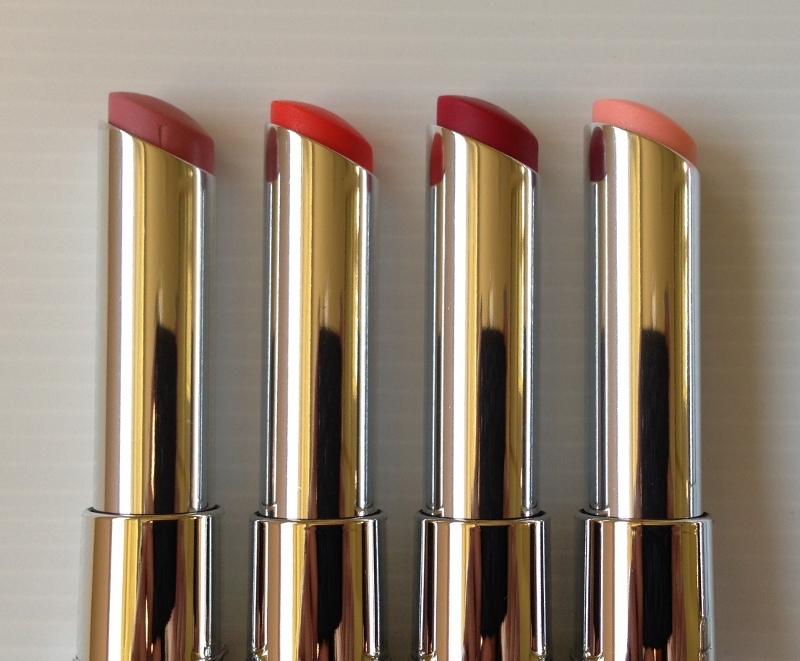 L-R:25 - Lust for Blush, 40 - Orange Attitude, 45 - Who Wore It Red-Er and 55 - One Size Fits Pearl. 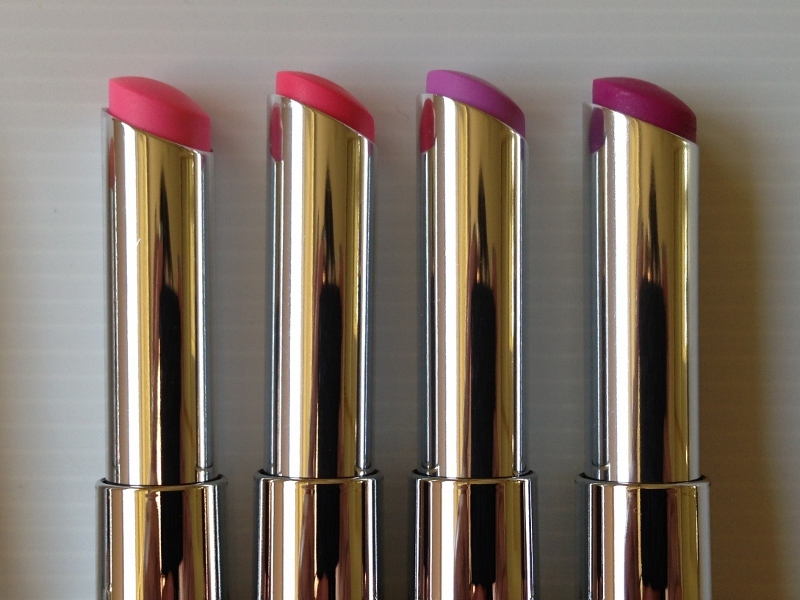 60 - Petal Rebel, 65 - Pink Possibilities, 90 - Oh La Lilac and 95 - Mad for Magenta. In terms of application, I would have to agree that they apply almost like a tinted balm, only with more pigmentation. 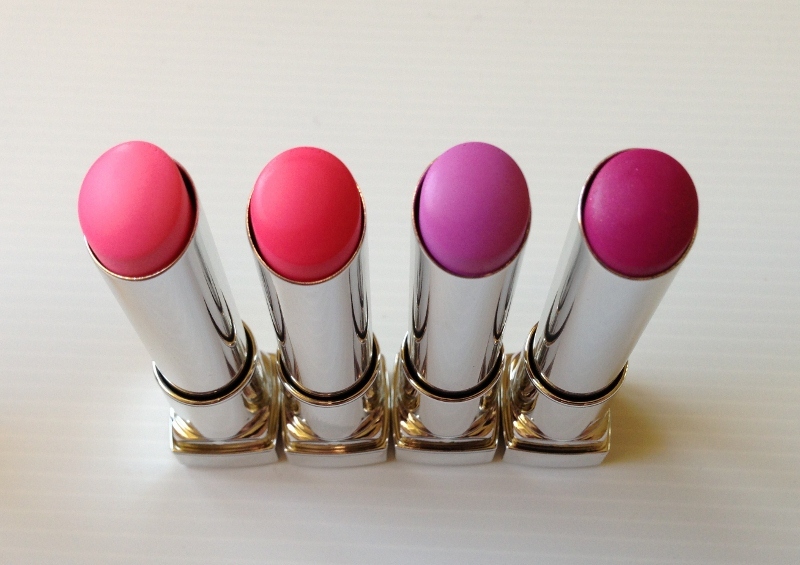 Once they are on your lips, you basically don't feel them, so they are very light and easy to wear. 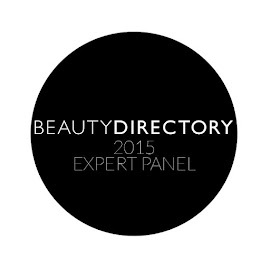 The darker colours are, naturally, more pigmented than the paler shades. 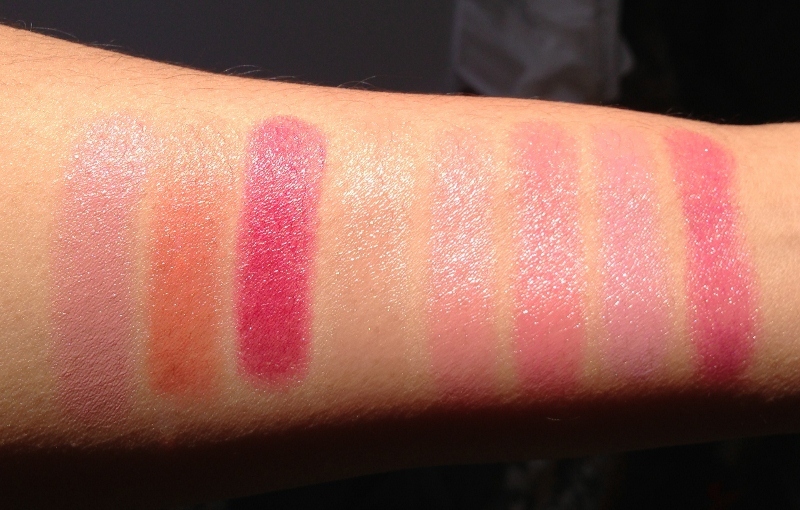 One Size Fits Pearl, for instance, tends to just disappear into my skin, you can barely see it from the swatches! I'll also point out that if you're prone to dry lips (as I am, which hasn't been helped much by Roaccutane), it does tend to accentuate your dry patches in the beginning. However, I find that after a little while, it acts as a lip balm would and actually smooths out the dry patches. As a result, I'd suggest either exfoliating and moisturising your lips very well before applying these, or making sure you give the Color Whispers time to settle onto your lips before venturing out! Overall, I give them a big tick of approval, and I've been wearing Orange Attitude, Who Wore It Red-er and Mad for Magenta a lot! If you've been thinking of introducing more colour into your daily look, but need to ease into it, these sheer, yet glossy shades are just the thing you need! I think they are just the thing for the upcoming warmer weather, as they provide a glossy pop of colour but are less heavy than your standard lipstick. 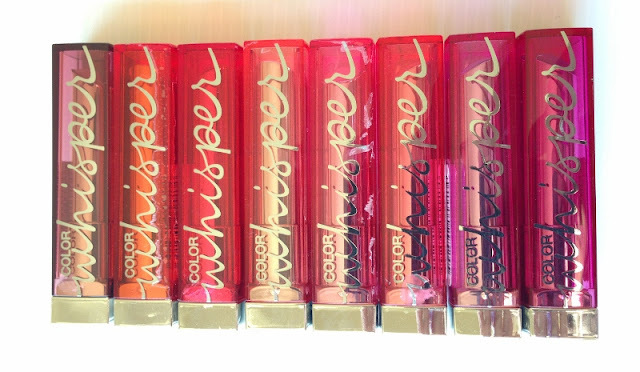 The Color Whispers retail at $14.95, but you can often catch them on sale at Priceline, Chemist Warehouse, Big W and other standard stockists, or shop them online here. What do you think of these, lovelies? Are you keen to try them? 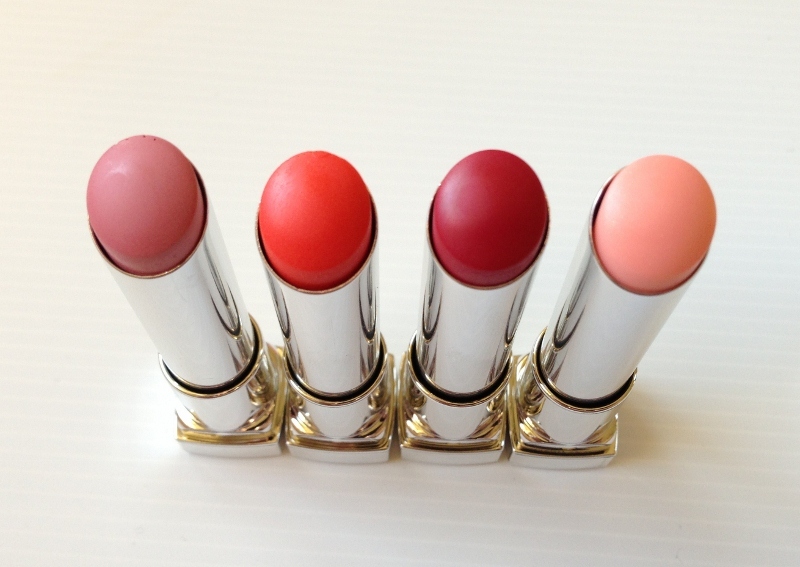 Which shades are you lusting after? Note: These products were kindly provided as part of my collaboration efforts with Maybelline. This has not affected my opinion in any way. For more information, please refer to my Disclosure Policy. God they look so pretty all lined up in a row! The gold tube makes them look really luxe but the other cap makes them look so fun. I'm finding myself wanting them. All of them. Now. They sound a little like the Clinique Chubby Sticks, they can cling to dry patches when applied as well but tend to really help condition the lips if given a little time and end up looking nice, would you say they are comparable in that aspect? Hope you feel better! I love the Maybelline Color Whispers! I have a few of them. I live in the USA so we have a great shade range. And OMG I can't believe they are so expensive there. I got mine for $6.99 and usually they are B1G1Half. I only have Petal Rebel, and I love it :) When I get off my spending ban I think I will be purchasing Mad for Magenta. So pretty! These look lovely - Thanks for the swatches - definitely want to pick up Petal Rebel and Mad for Magenta! These look amazing. Vita and I were swatching like mad at CW! You lucky lady! Yes I was swatching like mad with Ling, lol! I have Mad for Magenta as my sole shade and I love how weightless yet vibrant it is! These look gorgeous and you've really done them justice. Hope you're better SOON. Gorgeous photos! These look nice, 'who wore it red-er' looks really pretty. Orange Attitude looks divine!! Beautiful pictures too lovely. 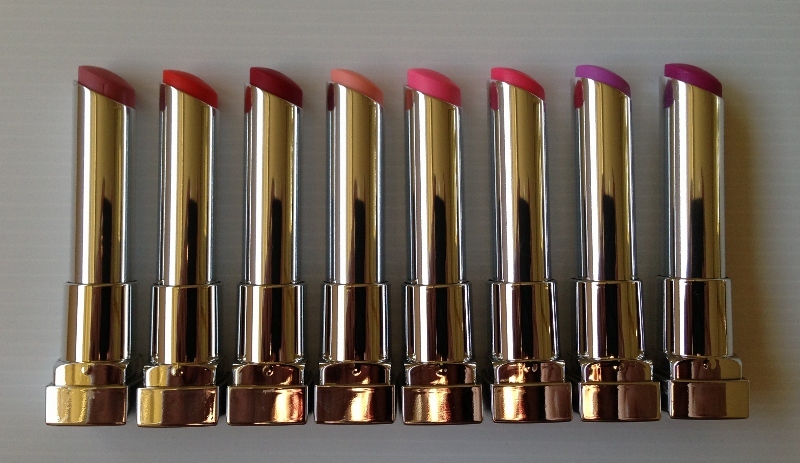 All the shades are amazing, thanks for a great review! I love how sleek the design is and Who Wore It Red-Er looks like a stand out shade!